Publisher's Weekly reports that Random House has dumped Paula Deen. 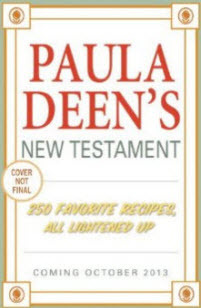 Paula's first book with Random House is a cookbook called Paula Deen's New Testament: 250 Favorite Recipes, All Lightened Up which is due out in October, 2013. The book has been #1 on Amazon.com and all her books are selling out as her fans rally behind her. Random House dumped Paula and issued a very brief statement saying that they made the decision "after careful consideration." Wal-Mart, Target, Smithfield Hams have all dropped Paula in wake of the controversy in which she revealed she used the n-word years ago in her home when describing being held up at gunpoint. She has apologized profusely and has gotten support from Al Sharpton and Jesse Jackson, but it doesn't seem to be helping. Barnes & Noble and Books-A-Million said they were planning on carrying the cookbook, which looks to be major bestseller. Paula's empire is crumbling. When Random House feels compelled to drop a #1 bestselling book that the author's fans obviously want, it's pretty much a total disaster. Paula has apologized profusely and has reached out to black leaders to help made amends, but it does not seem to be turning the tide. Paula's literary agent Janis Donnaud told PW that the Random House contract for other books is pretty much dead. But Donnaud says they've already had interest from other publishers and that the book will most likely be published by someone else. Paula Deen's other cookbook, Paula Deen's Southern Cooking Bible, has soared into second place on Amazon.com. People are leaving comments on the book's Amazon.com page saying the are buying it to support Paula.